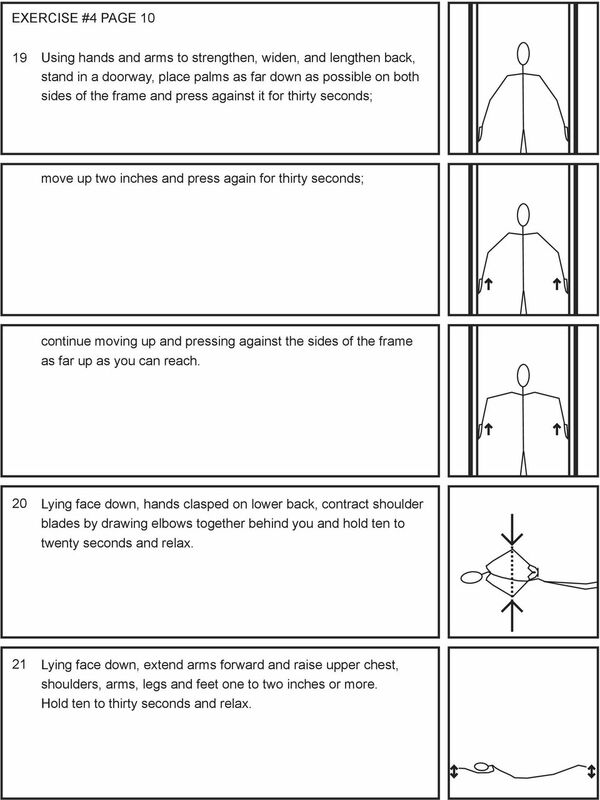 Download "Standing with legs slightly apart, inhale and expand chest and shoulders; exhale and draw in chest and shoulders." 2 EXERCISE #4 PAGE 2 and upward to left. 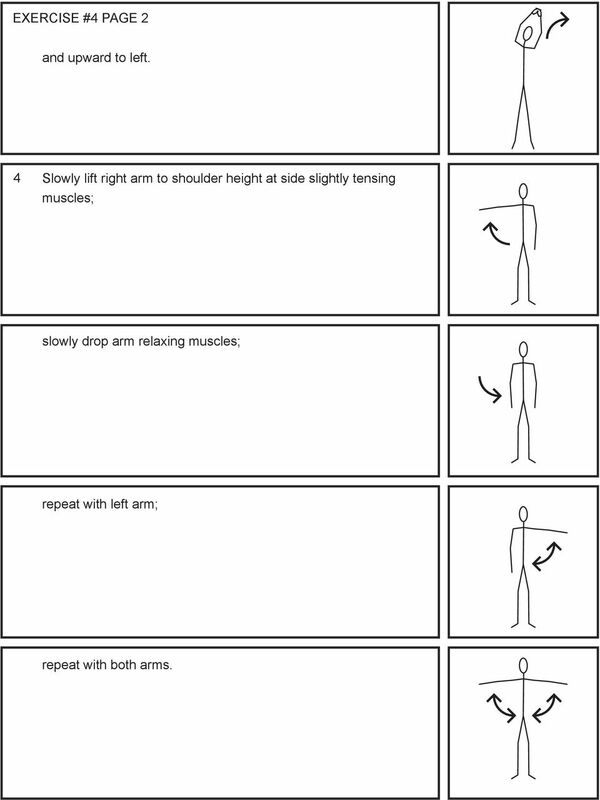 4 Slowly lift right arm to shoulder height at side slightly tensing muscles; slowly drop arm relaxing muscles; repeat with left arm; repeat with both arms. 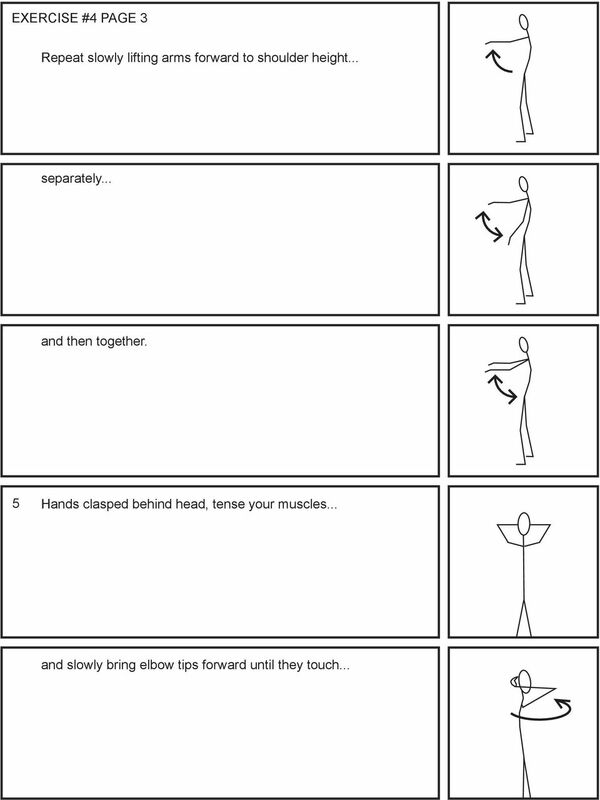 5 EXERCISE #4 PAGE 5 push arms out as though clearing away heavy brush with shoulders, arms, and hands; drop arms to sides. 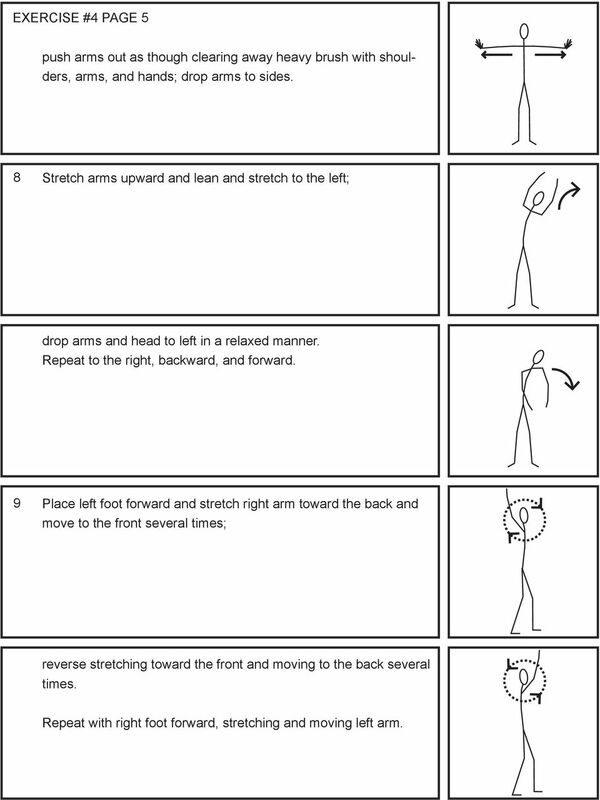 8 Stretch arms upward and lean and stretch to the left; drop arms and head to left in a relaxed manner. Repeat to the right, backward, and forward. 9 Place left foot forward and stretch right arm toward the back and move to the front several times; reverse stretching toward the front and moving to the back several times. 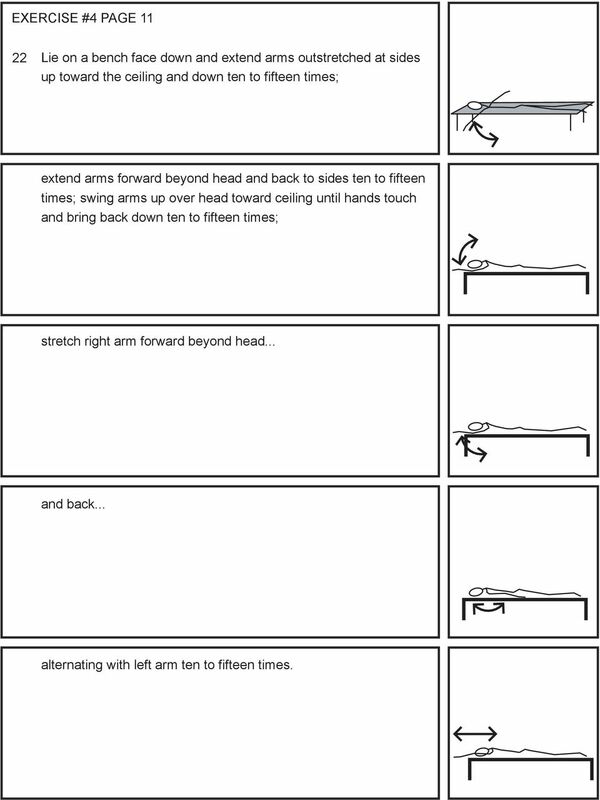 Repeat with right foot forward, stretching and moving left arm. 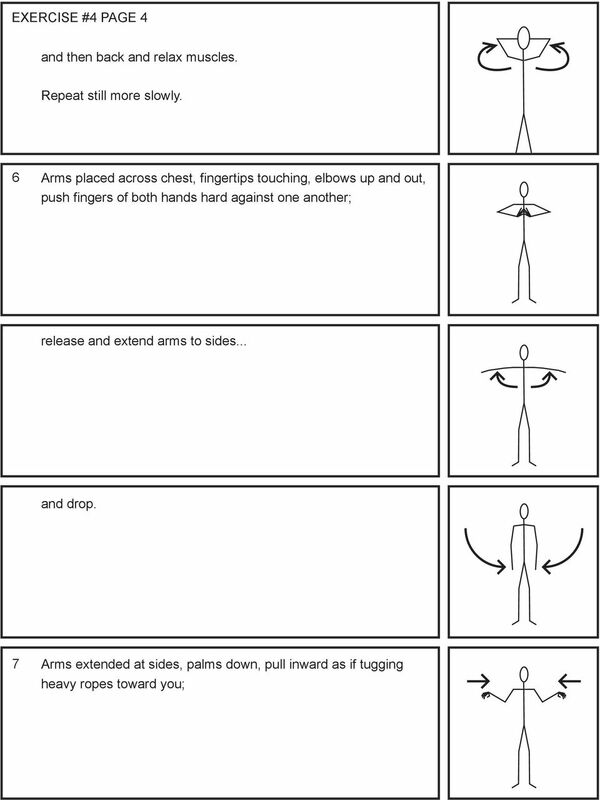 6 EXERCISE #4 PAGE 6 10 Raise arms forward to shoulder height; drop arms from elbows down and circle lower arms several times inward... and outward. 11 Place left foot forward and swing right arm fully from back to front and front to back. Repeat with right foot forward and left arm swinging from back to front and front to back. 12 Arms down at sides, slowly shrug right shoulder and drop; shrug left shoulder; shrug both shoulders. Repeat several times. 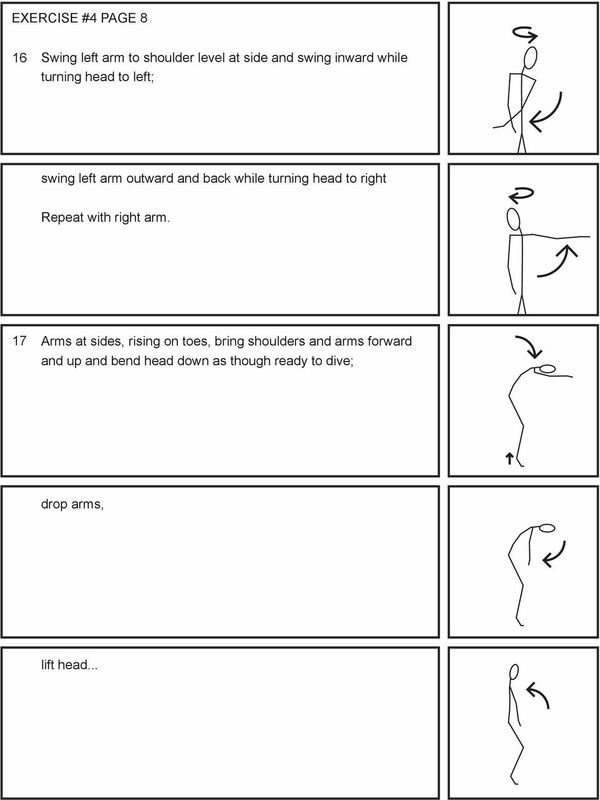 7 EXERCISE #4 PAGE 7 13 Arms down at sides, shrug and slowly draw circles with right shoulder moving it forward and drop; repeat with left shoulder; repeat with both shoulders. 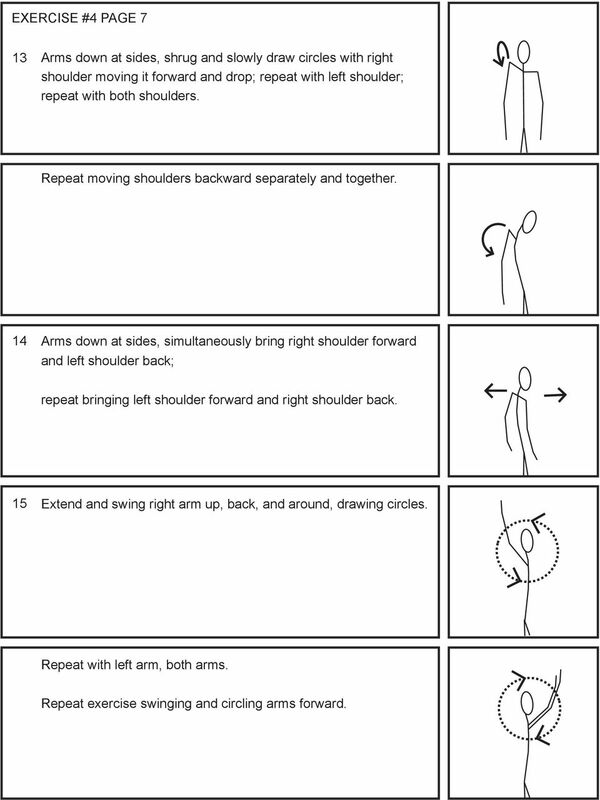 Repeat moving shoulders backward separately and together. 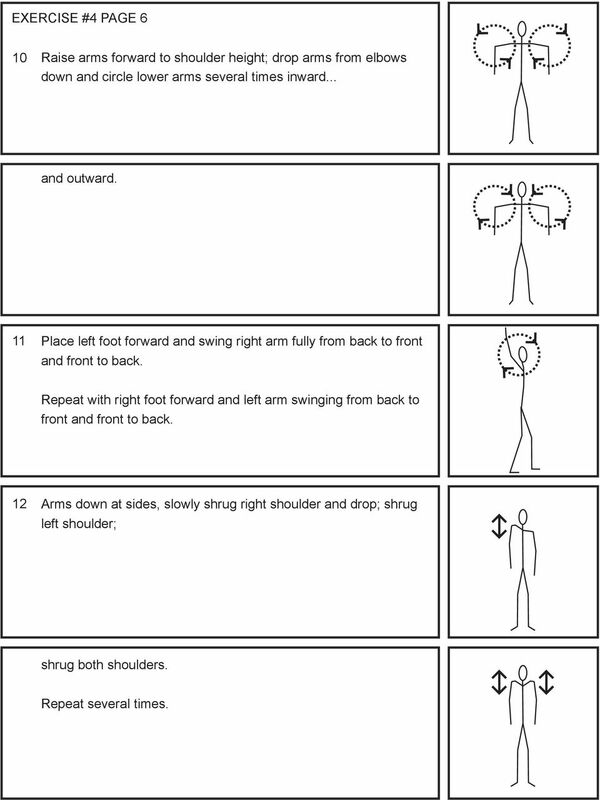 14 Arms down at sides, simultaneously bring right shoulder forward and left shoulder back; repeat bringing left shoulder forward and right shoulder back. 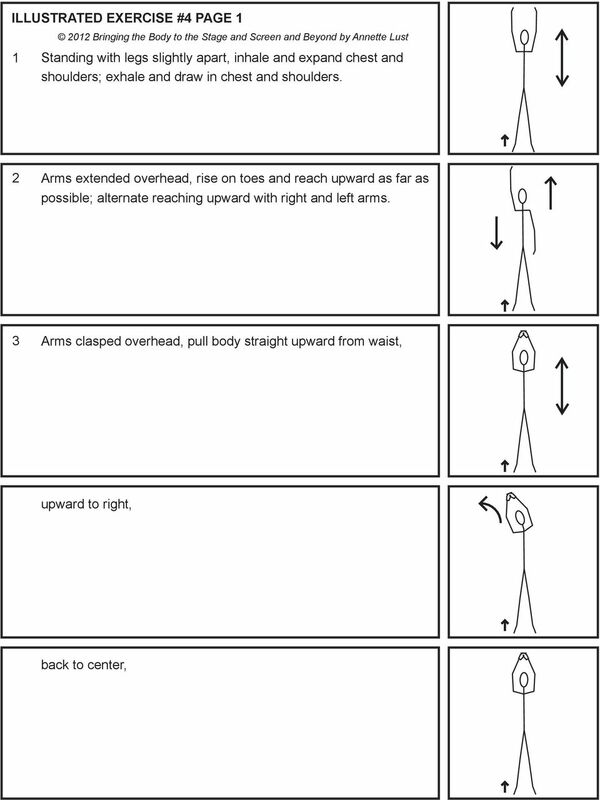 15 Extend and swing right arm up, back, and around, drawing circles. Repeat with left arm, both arms. Repeat exercise swinging and circling arms forward. 9 EXERCISE #4 PAGE 9 expand chest, and straighten shoulders. 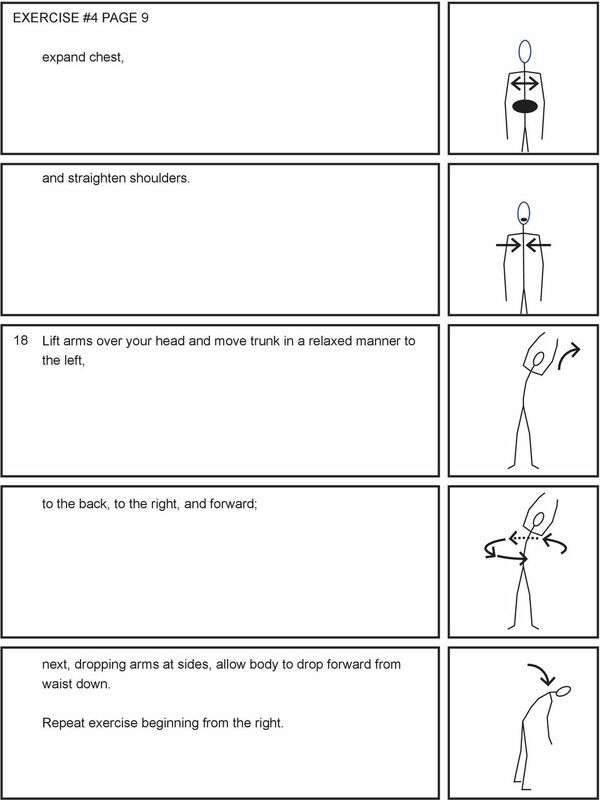 18 Lift arms over your head and move trunk in a relaxed manner to the left, to the back, to the right, and forward; next, dropping arms at sides, allow body to drop forward from waist down. Repeat exercise beginning from the right. 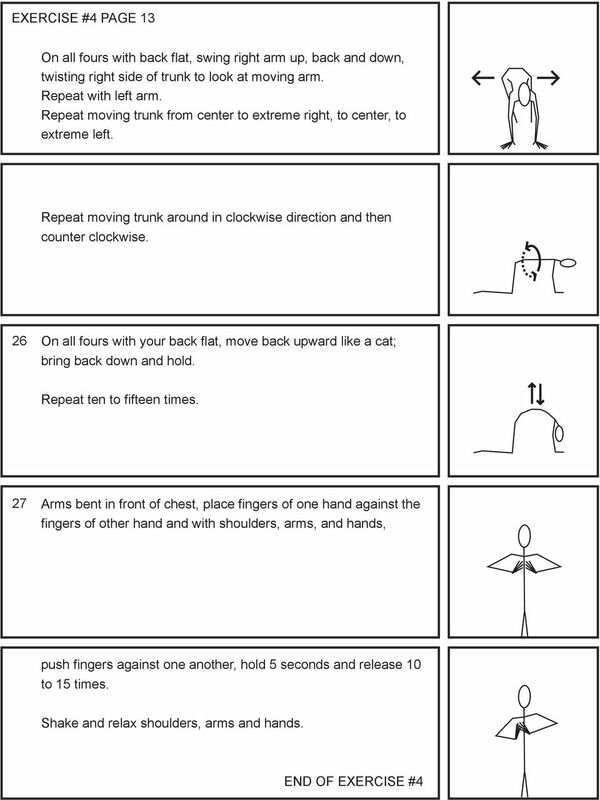 10 EXERCISE #4 PAGE Using hands and arms to strengthen, widen, and lengthen back, stand in a doorway, place palms as far down as possible on both sides of the frame and press against it for thirty seconds; move up two inches and press again for thirty seconds; continue moving up and pressing against the sides of the frame as far up as you can reach. 20 Lying face down, hands clasped on lower back, contract shoulder blades by drawing elbows together behind you and hold ten to twenty seconds and relax. 21 Lying face down, extend arms forward and raise upper chest, shoulders, arms, legs and feet one to two inches or more. Hold ten to thirty seconds and relax. 11 EXERCISE #4 PAGE Lie on a bench face down and extend arms outstretched at sides up toward the ceiling and down ten to fifteen times; extend arms forward beyond head and back to sides ten to fifteen times; swing arms up over head toward ceiling until hands touch and bring back down ten to fifteen times; stretch right arm forward beyond head... and back... alternating with left arm ten to fifteen times. 12 EXERCISE #4 PAGE Lying on the floor on back, legs bent, hands clasping back of neck, flatten back and then raise head and shoulders from floor, hold five seconds and slowly drop back to floor. Repeat moving to right and left. 24 Sitting on the floor, legs apart, hands behind neck, alternate bending trunk to right and to left leg. 25 On all fours with back flat, swing right arm up, back and down, twisting right side of trunk to look at moving arm. Repeat with left arm. SHOULDER PULL DOWNS. To learn efficient use of the shoulder blades and arms while maintaining a neutral spine position. Perform all of the exercises slowly and with good control. Avoid jerky or throwing motions, and do not bounce when stretching. Take a few minutes for yourself and incorporate some Office Yoga into your daily routine. Doing yoga can help relax your body and mind. You can try these poses at times of stress. ISOMETRIC EXERCISE HELPS REVERSE JOINT STIFFNESS, BUILDS MUSCLE, AND BOOSTS OVERALL FITNESS.